flexibility in dogs and cats. Flexadin® Advanced with UC-II® is made from a breakthrough formula that supports healthy joints and flexibility in dogs and cats of all ages – and sizes. By administering 1 chew daily for any size cat or dog, you can help ease joint stiffness and help support a healthy immune system. That’s something to wag about. Unlike products that use glucosamine and chondroitin to mixed results, Flexadin® Advanced is specially formulated with UC-II® to support healthy joints and flexibility in dogs and cats. UC-II® is an undenatured type II collagen that works with your pet's immune system to help reduce the soreness and discomfort that can be caused by collagen that has loosened from wear and tear on the joints. 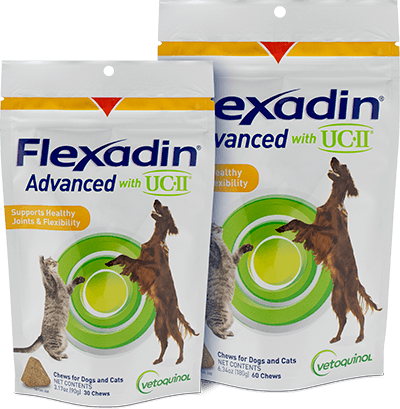 Flexadin® Advanced with UC-II® is a one-size-fits-all regiment for cats and dogs. No matter your pet’s age or size, one chew a day is all they need. Consult your veterinarian before giving your pet Flexadin. Follow the recommended administration on the package, unless otherwise instructed by your veterinarian. Flexadin® Advanced with UC-II® is so important to Wade Marrs that he gives it to every dog on his Iditarod dog mushing team! Watch the video to meet Sockeye and learn more from Wade. UC-II® and logo are trademarks of Lonza and its affiliates.